Utilizing the latest in CAD/CAM software, lasers, and forming equipment, Modineer can provide parts to our customers quickly and accurately in whatever form required. We can provide a fully finished part for our customer, complete with the required hardware, welding, and finishing making. Modineer is a true single-source supplier for all fabricated parts. Stamping presses and press brakes allow Modineer to select the manufacturing process that best suits your component, lowering your total cost. With die design done in-house, we can easily offer the most appropriate manufacturing solution for your specific needs. By considering volume and component tolerancing, we help you evaluate the most economical manufacturing technique. All of our welders maintain AWS certification to ensure that our customers receive work that meets the highest possible standards. Our welders maintain certifications that include AWS D1.1, D1.2, D1.3, and D1.6. We offer GMAW, GTAW, FCAW, plasma, spot, resistance and TIG welding. 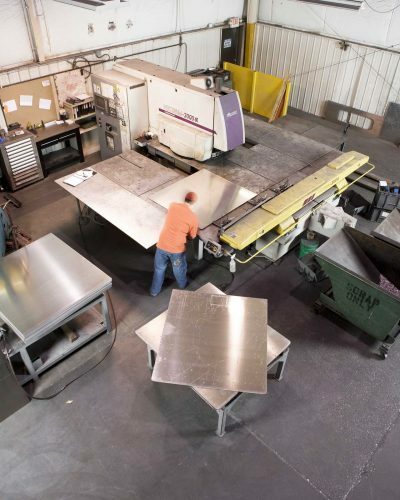 We are capable of welding up to 1” steel, ½” aluminum and ½” stainless steels. Coupling our laser, forming, and welding capabilities, with our fully integrate E-coat, Powder Coat, and CARC painting lines, we offer a one-stop shop for all your fabrication needs. Modineer provides all the pre-treatment and top coats, each in accordance with numerous industry-standard OEM paint specifications.